Born/lived: Savannah, GA. Known for: landscapes, marines, architecture, portraiture and still-lifes done in New York, Washington, North Carolina, South Carolina, Georgia and Florida. 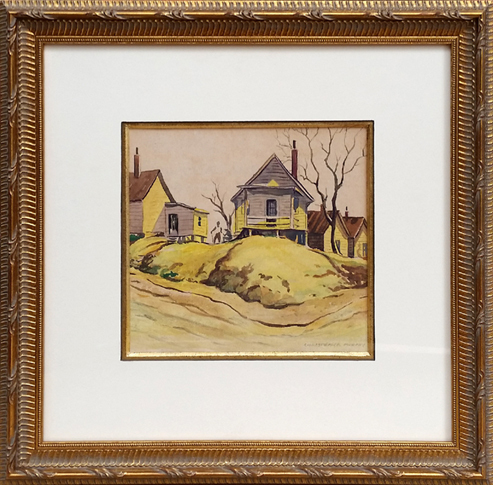 He painted urban and rural scenes, from classical structures of the 19th Century coastal mansions to the native dignity of small churches with inventive steeples and details. Studied: Art Students League, NY with other known artists such as Frank Vincent DuMond, George B. Bridgman, Joseph Pennell, Eliot Clark, & William Chadwick. Benedictine School, Savannah, GA, Telfair Academy of Arts and Sciences, Savannah, GA, Beaux Art Institute, NY, The Tiffany Foundation, NY. He received his training as an artist initially from his parents, Christopher Patrick Hussey Murphy and Lucile Desbouillons Murphy, both of whom were artists. Another early influence was that of Hardesty G. Maratta, inventor of the Maratta Theory of Color, which went beyond the triad and spectrum tradition of that time. Exhibited: Southern States Art League & won prizes; Cleveland Print Society; Brooklyn Society of Etchers; American Fine Arts Society; National Academy of Design; New York World’s Fair; Whitney Museum; First National Exhibition American Artists, Rockefeller Center; Sesqui-Centennial Exposition, Philadelphia; Invited Exhibitor American Federation of Arts-Outstanding Etchers of United States as Victoria and Albert Museum, London, England; SSAL(prize, 1927, 1931), One-Man Shows: Atlanta,1973; Miami, 1951; Plainfield, NJ, 1928; Rochester, NY, 1948; Telfair, 1947. Member: Southern States Art League, Savannah Art Club; Georgia Assoc. of Artists; Tiffany Gallery; Savannah Art Assoc. Work: mural, Richard Arnold School, Savannah, GA. Taught: Armstrong College and Telfair Academy of Art, Savannah, GA. Publications: book of etchings and drawings, “Savannah”, 1947. Awards: Tiffany Foundation Fellowship. Artist Last Name Murphy, Jr. Comments This painting is nicely matted and framed and in excellent condition.